People say it all the time … be careful about who you spend your time with. I think it’s important from time to time to remind yourself of this and then make thoughtful choices about the friendships in your life and who you’re spending a lot of your time with. This is something I’ve had to do at different times in my life and I can’t say it’s always easy to do. You get comfortable and you’re used to being around certain people. But, you can love people from a distance and wish them the best. They don’t have to be a part of your everyday life. As I look back on all the friendships and relationships I’ve had (the good ones and the not so healthy ones), every time I was surrounded by the right people, I was also making better decisions about my own life. It wasn’t that these friendships were problem free, but there was a certain ease, sense of enjoyment and I was learning important things about myself. There’s just something to be said about spending your time with people who share the same commitment you have to live life in the best way and are actually taking action every day to make that happen. You know those times when you’ve been pushing and pushing for what feels like a very long time? You’ve been handling a lot—taking care of problems, searching for answers, and trying your best to not feel stressed or overwhelmed. Maybe today is one of those times when so much is going on in your life. I know it is for me. Well, if you’re like me, there are still more things you need to work through and a lot that still needs to fall in place before you can let out a sigh of a relief. So, how do you keep going? This is what I asked myself: What’s the best way to find the strength to push forward? Do you want to know something that finally dawned on me? 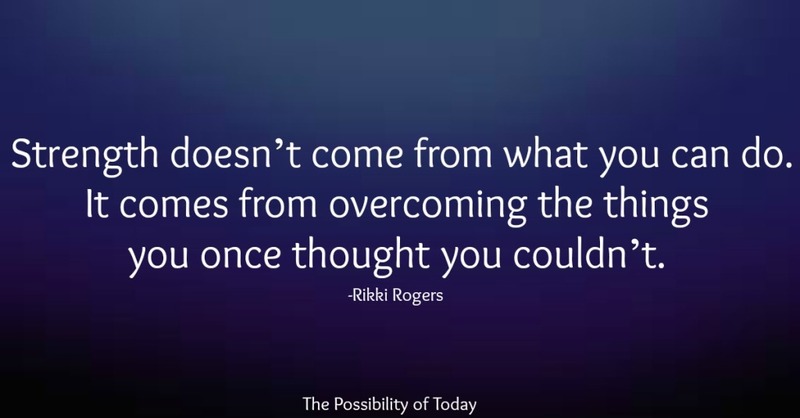 You can overcome doubts by realizing that you don’t need to know “how” things will fall into place. In fact, we are supposed to trust and completely believe that everything will work out, even if we can’t see “how”. There’s a big difference between “hoping for the best” and actually trusting and believing things will work out perfectly. That used to be the way I thought about things too. I needed some kind of proof before I could completely believe in something and feel like I could actually get my hopes up. Sure, staying positive and having hope is great, but strengthening our belief and trusting that everything will unfold perfectly is so much better. You know those times when you’re waiting on something you really want to happen? 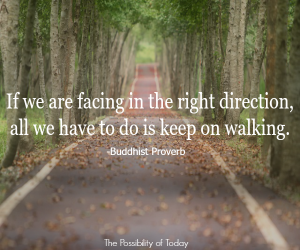 You’ve been doing your best to figure things out and push forward day after day, but you’re still waiting on things to completely smooth out and finally fall into place. Actually, maybe today is one of those times? I know it is for me. For what feels like a very long time, I’ve been working and waiting for certain things to fall into place in my life and with my work. Well, something important dawned on me the other day about these times. Actually, one of my favorite quotes of all time popped into my mind. It’s a great Truth to remember when you’re doing everything you can, but you’re still waiting on things to fall into place. “We must accept finite disappointment, but never lose infinite hope.” Martin Luther King, Jr.
Have you been hoping and waiting for certain things in your life to fall into place? I know I have. Do you also feel like it has been a very long time and a very long road? But, have you noticed how feeling at peace while you’re waiting on things to fall into place isn’t the easiest thing to do? You’re doing your best to faithfully take steps forward but then new problems come up or the same old problems linger. You may even still have some doubts about if or when things will finally come together. Isn’t that a great quote? It’s actually one of my favorite quotes of all time. And, Today, if you’re like me, and also have a lot going on, this is a great quote to remember. Even if everything isn’t 100% perfect today, when you’re honest with yourself and you look at things from the right perspective, you can see that at least 90% of the things in your life are working and going right. That’s right, 90%. And, 90% is a lot going right. 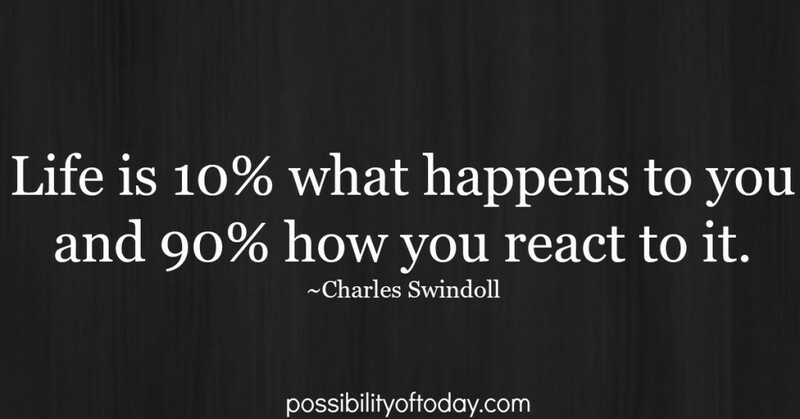 But, have you noticed how your mind will try to focus mostly on what’s wrong or the 10% that’s not working? It’s like all the bad stuff comes to mind quickly and sticks around, but it’s not as easy to remember and stay focused on all the good stuff that’s going well. I’ll admit it. I was a bit naive. I used to think the day was going to come when that negative voice in my mind would be gone once and for all. You know the voice that’s notorious for focusing on all the wrong things. It continually tries to get you to worry about one thing or another. I call it the Chief Negativity Officer and its always quick to respond anytime something goes wrong or you have any doubts. Happy New Year. We have officially made it through 2014. Was last year as crazy of a year for you as it was for me? It was filled with challenging times, good times, ups, downs and so many curve balls. But, that’s the way life goes, isn’t it? 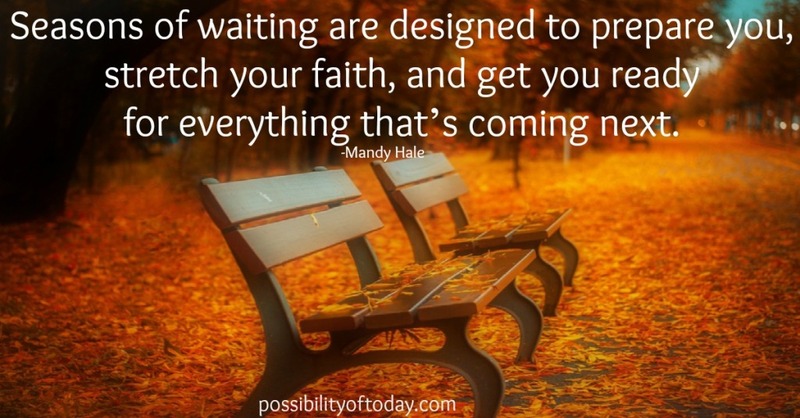 Have you been waiting on something to show up in your life for awhile? Maybe you’ve been working to accomplish something and you’re so ready for things to fall into place. Or, maybe you’ve been working through problem after problem and you really want things to finally work out. 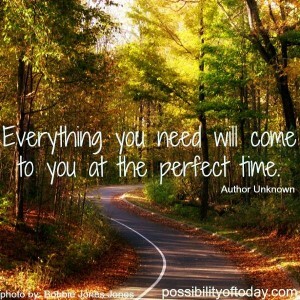 Many of us (myself definitely included) have been managing through a “season of waiting”. Do you feel like it’s been a long road? I know I do. Of course it’s been worthwhile and an important part of our journey. I get that and I definitely appreciate the fact that everything really does happen for a reason. But, my oh my! … it’s been a wild ride hasn’t it? There have been the “highs” – those times when you felt really good and confident. You thought you were doing the right things and it was only a matter of time before things fell into place. But then things didn’t exactly work out as you planned. So, then came the “not so highs” – those times when everything felt hard. Your doubts surfaced continually trying to overshadow your faith that everything would work out. Here’s the good news. It’s time for this “season of waiting” to be over. It’s time. It’s finally time. You’ve gotten stronger. 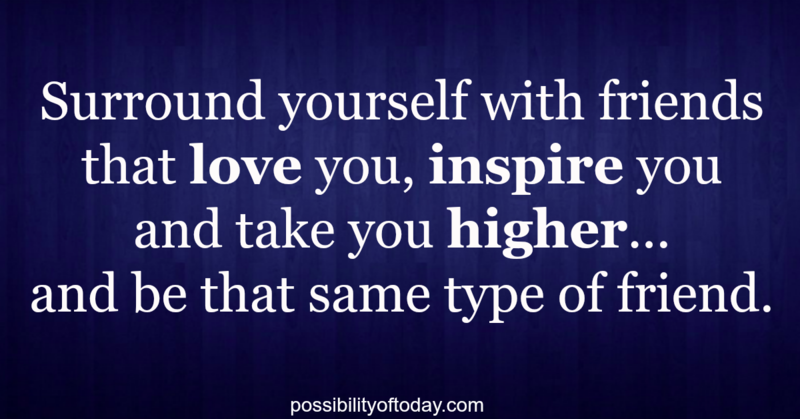 You’ve learned so much about yourself and what you’re truly capable of. Your faith has been stretched. Your belief in what is possible has expanded. You’ve made it through so much and every single thing that happened has led you to this point. Have you always had great Thanksgiving days? I was thinking about some of my past Thanksgivings and I realized I didn’t always do Thanksgiving “the right way”. It’s not that I didn’t enjoy the day and feel grateful for all my family and friends. But, there were so many years I wasn’t taking full advantage of enjoying and experiencing the day because I was distracted by many of the thoughts running through my mind. Other times I would be thinking or worrying about things that had nothing to do with Thanksgiving day. Have you ever noticed all the thoughts that can recycle through your mind over and over again and take your attention away from enjoying and experiencing the moment in front of you? A lot of times you may not even realize how much your mind is wandering and how all your worrying, thinking, and mental complaining is affecting how you feel. That was the trap I was falling into and not even really realizing it. But, I finally figured out there is a better way to move through the day … a much much better way.